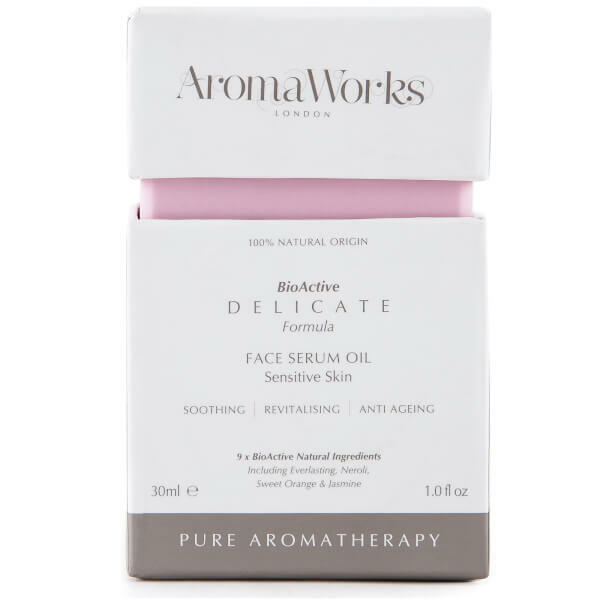 AromaWorks' Delicate Face Serum Oil is a gentle formula infused with essential oils and BioActive ingredients to calm and smoothen the appearance of skin. Targeting signs of ageing and loss of elasticity, the serum oil delivers a host of Vitamins and Antioxidants to help comfort and tone the skin whilst reducing visible signs of ageing. Infused with an aromatic fragrance powered by Orange, Jasmine and Neroli. Apply a small amount to the face and neck before moisturising. Capric/Carprylic Triglyceride, Moringa Oleifera Seed Oil, Simmondsia Chinesis (Jojoba) Seed Oil, Citrus Aurantium (Neroli) Oil, Orange (Citrus Sinesis) Peel Oil, Jasminum Officinale (Jasmin) Oil, Lavandula Latifolia (Spike Lavender) Oil, Bergamot (Citrus).